The factors that contribute to the quality of our wines are: geology, exposure, distance from the mountains, altitude and influence of prevailing winds. A combination of these elements results in different zones and microclimates which in turn develop wines with their particular characteristics. The optimal interaction between site and variety is therefore the final key to producing a wine of excellence. 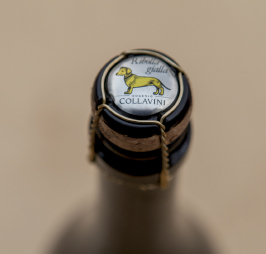 The winery is located in Corno di Rosazzo, in the south-east area of the DOC Colli Orientali del Friuli and borders the DOC Collio of Dolegna and Cormons to the east. Considering the abundant variety of Friulian hills and that our production draws from both these DOC areas, it follows that our terroir is rather complex. THE TERROIR “Ponca” is a specific rocky mix of soils that originated in shallow lake basins where currents caused the frequent alternation of hard and soft layers; sandstone and marl. In terms of water availability, the sequential layers’ sedimentation calibrates the available amount of water that a grapevine could use. The sandstone layer transmits and drains the excess water; and then the marl works as a sponge, absorbing and holding the water into the soil. The entirety of the underlying bedrock and its intimate connection with the grapevine’s roots gives these “Ponca” Friulian wines their charateristics. THE SUN A grapevine works like a photovoltaic panel that absorbs light energy. Given the gradual increase of latitude, the hills are a good place to plant vineyards. While vineyards cultivated in the southern slopes absorb more light during the day, those located in the south-east intercept low temperatures and light in the morning and reduce their photosynthesis in the afternoon. This condition turns out to be particularly good for white aromatic wine varieties (Sauvignon and Chardonnay) or for the “spiced” red varietals such as Schioppettino. On the other hand, vineyards facing a south-east exposure give their best during the hottest hours of the day, offering us back “warm” varieties of white wines (Ribolla Gialla, Friulano, Malvasia) or riper red grapes due to their tannins. THE MOUNTAINS The cold wind, progressively descending from the mountains, pushes the hot air towards the valley and the plains. As a consequence, the slopes of the mountains will be colder than the plains. THE HEIGHT Collio and Colli Orientali hills can reach 250 meters above sea level and the gap between the lowest and the highest sides is about 150 meters. Given that altitude affects air flow, the rule is that the higher the altitude, the lower the temperature and humidity. THE WINDS The Bora, sometimes blowing at high speed from the east and north-east, is the wind that mainly influences our hilly viticulture. Wiping out humidity and refreshing the most exposed slopes, the Bora, is beneficial for all the Collio area as well as the southern part of Colli Orientali. Even if these five crucial key points represent the oenological potential of our Friulian terroirs, geopedology still plays a big role in defining them.